Jim, if the logic of the A9 diagram is correct, you shouldn't have to bypass anything; otherwise, 99 % of the KLR650s produced for the past 25 years would not start! As to the ignition working; imagine it's always ARMED, only disabled when the exciter coil wire is grounded. still fideling with my '98. Took your suggestion and called Bob at TPI. He says they gotta do this kind of work after hours and suggested I bypass the starter lockout & the sidestand switches before I give up. 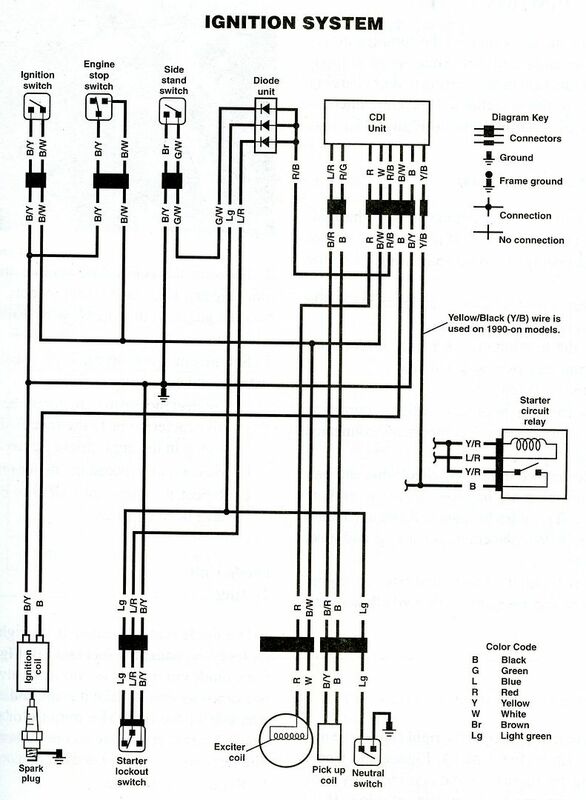 I just checked again those switches with an ohm meter and they both function as the legend on the A9 diagram wants them to. Do I still need to bypass? If so, I cannot make sense of which wires to short from info on the forum. Can you find it, in your mind, to advise me(after all I have put you thru up to this point?? The bike cranks now but has no spark. I replaced the start button harness(with the kill sw harness). I've been pulling the lugs from the connectors that kill the mag for normal shutdown but have them all connected up now. Should the ignition have worked with those blk/wh wires hanging?? Isn't there a "New Thread" button, to registered members? Are you a registered member? Check with one of the moderators; I'm awfully cyber-ignorant. Erm, the older ones, too. 06:14 PM - Tom Schmitz mentioned Damocles in post Relay Question... Easy but hard??? 11:46 AM - Daniel Kavcak mentioned Damocles in post Under powered KLR, Any Advice? 11:32 AM - Daniel Kavcak mentioned Damocles in post Inverted Forks and Other Goodies That Will Work? 09:44 AM - VTWoodchuck quoted Damocles in post Oil Drain Plug Length?